LOUISVILLE, Kentucky, March 4, 2012 (ENS) – Thirty-seven people across five states have died and hundreds were injured as nearly 100 tornadoes ripped across America’s heartland Friday, spawned by a powerful thunderstorm system stretching from the Gulf Coast to the Great Lakes. 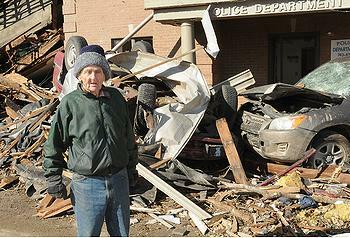 The twisters wiped out entire towns, including Marysville, Indiana, population 1,900. Homes and schools were demolished, vehicles and planes were tossed around, trees were uprooted and power lines flattened. When the storms blew over, 20 people had lost their lives in Kentucky, 12 people died in neighboring Indiana, three in Ohio, one in Alabama, and one in Georgia, officials said. Officials in Indiana first reported 14 deaths but have lowered that figure to 12 after officials in southern Indiana’s Scott County reduced their death toll report from three to one. No reason was given for the confusion. Friday’s storms followed thunderstorms and tornadoes across the heartland earlier in the week, bringing the overall death toll to at least 50 people. “The gates of hell opened up,” mourned one emergency services call dispatcher. 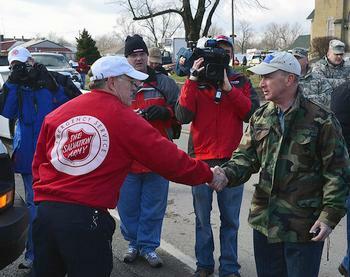 Examining the extensive damage in Henryville, Indiana on Saturday, National Weather Service meteorologist Joe Sullivan said one of the devastating tornadoes was an EF4, traveling with a wind speed of about 175 miles per hour when it crossed Indiana. He told reporters the death toll could have been much higher but the NWS weather warning system was able to alert people in advance of the storms. The weather service had a conference call with Indiana officials two hours before the storm hit, prompting many school districts to let students go home early. All the Indiana deaths happened in southeastern Indiana, including substantial damage in Henryville in Clark County, Marysville in Clark County, and Pekin and New Pekin in Washington County. Widespread power outages have been reported across southern Indiana, and due to the many gas leaks, all natural gas services have been turned off in Henryville. A 20-month old girl who survived being blown more than a mile from her home in New Pekin, Indiana, died today. 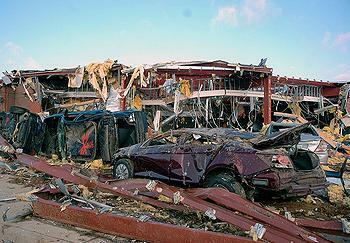 Angel Babcock was found by herself in a field after her parents and two siblings were killed in a tornado. The girl was taken to Kosair Children’s Hospital in Louisville, Kentucky, She died from traumatic brain injuries at 4:10 pm local time according to the coroner’s office. Her grandparents and doctors had taken her off life support because of the severity of her injuries, ABC News reported. On Saturday, President Obama called Governor Daniels, Kentucky Governor Steve Beshear, and Ohio Governor John Kasich to express his concern for those affected by the severe weather and tornadoes this week and condolences to families who had lost loved ones. The President acknowledged that the extent of the damage may not be known for days, and reiterated to each governor that the Federal Emergency Management Agency, stands ready to provide assistance, if necessary, to the extensive response efforts already underway in each state, led by the governors’ teams. At all times, FEMA maintains commodities, including millions of liters of water, millions of meals and hundreds of thousands of blankets, strategically located at distribution centers throughout the United States. To support the tornado-affected states, FEMA has coordinated with the Department of Defense to establish a national Incident Support Base in Kentucky to stage commodities close to the impacted areas. More than 98,000 meals and 146,000 liters of water are en route to the Incident Support Base. In Kentucky, Governor Steve Beshear declared a statewide emergency Friday to allow local officials immediate access to state resources for their public safety and recovery efforts. Twenty-seven counties across Kentucky reported damage and officials estimated that 300 people were injured in the tornadoes. Emergency managers strongly discourage people from traveling to affected communities to offer help. People who want to offer assistance should contact their local Red Cross chapter for information, said the governor. In Indiana, too, emergency officials say unsolicited help is not needed. Police say they do not need any help in Henryville. A state of emergency has been issued and people who approach the devastated town will be turned away. 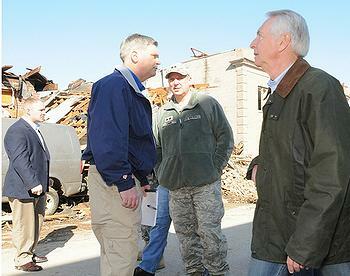 At the requests of the states, FEMA and the Small Business Administration have deployed teams to Missouri and Illinois to assist with preliminary damage assessments. These assessments identify the damages in impacted counties and to help the governor determine if additional federal support will be requested. Alabama officials said a prison, the Limestone Correctional Facility, sustained roof damage to two dormitories and damage to a perimeter fence. Some 300 inmates were moved to another location within the facility. No one was seriously injured at the prison and there were no risk that prisoners might escape, said a spokesman for the Alabama Department of Corrections. The weather service said the teams of meteorologists will continue damage estimates Sunday. The forecast for the tornado-affected area is for snow and rain today through Monday.